Amazon: If you could write your own epitaph, what would it say? 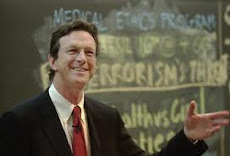 Michael Crichton: I don't want an epitaph. If forced, I would say "Why Are You Here? Go Live Your Life." Amazon: Who is the one person living or dead that you would like to have dinner with? I like to think that Michael Crichton and Benjamin Franklin are having a high old time right now. New on Crichton's Website: "Remembering Michael"